The new draft House of Representatives Law will include seats for women, Copts, as well as Egyptian expats and special needs representatives, reported Al-Ahram newspaper Sunday. According to Al-Ahram, Minister of Transitional Justice Amin Mahdy discussed with the legislation department in the State Council the draft law, and the Political Rights Law, Saturday. 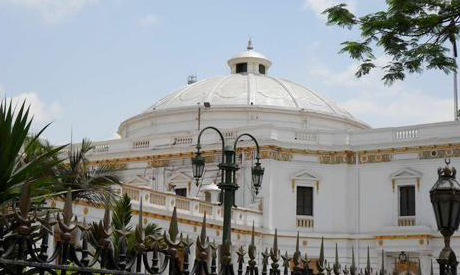 Judge Mohamed Gamil Ibrahim, a member of the legislation department in the State Council, told Al-Ahram that the draft House of Representatives Law would state that the number of individual seats would be 450 while 150 seats would be elected by the party list system. Judge Ibrahim added that each list would include a quota for three women and three Christians, as well two representatives from among workers and peasants. He also revealed that there would be seat per list for Egyptian expats and another for a special needs representative in the new House of Representatives. The draft House of Representative Law also includes limits on election campaign budgets, for both individual and party list seats. According to the 2014 Constitution, procedures for parliamentary elections must begin by 17 July 2014, following presidential elections held 26-28 May. Seats for expats? Are they kidding? They are called expats for a reason; they don't live in the country! What would a person not living in the country know about its problems or how its people face those problems on an every day basis - even if they are Egyptian? And how are they suppose to represent those people if they don't live amongst them? This isn't politics, it is a mockery of every Egyptian's intelligence. Giving your opinion and going into politics, representing the people, and debating every day issues on behalf of those people, and campaigning for those people, and relating with those people are completely different things. What you're talking about should be more of a consultive role but not an elected representative of the people. Yes, I'm an expat with no ambitions though to go into politics. I do see advantages if a small nr of expats give their opinion as they have experienced how problems are solved in other countries. This could be very useful for Egypt.